South Africa is well known for its wilderness areas and the many walking trails that allow you to explore them. This week we will visit one of the premier wilderness areas of the Western Cape. Clanwilliam and the Cederberg are about a three hour drive to the north of Cape Town. Evidence of their stay in the area can be found in the many caves and rock overhangs found in the mountains. There are hundreds of rock paintings and etchings to be found all over the Cedarberg and there are many of these that have yet to be discovered. You could even unearth one of them while visiting the area. The Cedarberg is home to the leopard. It is one of the few areas in the Western Cape where they are able to roam free in the mountains and where they are also protected. 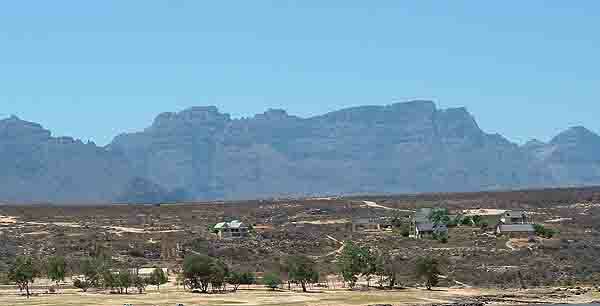 In the northern Cederberg, are several dams which provide relief to animals during the intense summer heat. Winters can be very cold with snow in the mountains. There are some well known rock formations in the area and I will name some of them. The Maltese Cross which is a large rock that has been carved by wind and weather into the shape of a cross. It is high up in the mountains and can be seen from a distance. The Wolfberg Arch which is a large rock that has been hollowed out by wind and weather is a five hour hike up into the mountains from Algeria. There are a number of farms in the valleys between the mountains and they cultivate grapes and produce wines. On a farm known as Sanddrift is the Matjies river. A couple of miles north of the farm if you follow the course of the river you eventually came to a big rock formation where the river flows down from the mountains and forms a big rock pool. The locals called it” Maalgat” (Whirlpool). When we were there it was very calm and flat. I imagine that when the river is in flood it could turn into a whirlpool. The pool is very deep and is lovely to swim in during the heat of the day. The forest station is situated about 40 kilometres north of Citrusdal and is built on the banks of the Rondegat river. (Round Hole) where the authorities have established a campsite which can accommodate 46 caravans and tents. This shady terrain in idyllic forest surroundings makes an ideal base for hikes in the area. The Reserve is situated between the two small towns of Citrusdal and Clanwilliam and is about 70000 hectares in size. A number of animals can be found there. The largest cat is the leopard followed by the caracal which looks like a lynx. There are a variety of antelope as well. Springbok, klipspringers, and reedbuck to name a few. The rare mountain zebra can be found on the bushy hillsides where they graze. Smaller animals such as meerkats and mongooses live in the reserve and hunt scorpions for their supper. As there is much to see and do in this part of the Western Cape I recommend it to the visitor who wants to get away from it all. In this wilderness you can walk the trails, climb the mountains, swim in the rivers and rock pools, view bushmen paintings, discover your own, or just find yourself a nice quiet spot near the river in the campsite and relax. We'll see you in the Cedarberg soon.